Mike Skinner AKA The Streets Appreciation Week - Day 6. Tonight, Mike Skinner's debut cameo role in Doctor Who was televised. He was at the very beginning for about 30 seconds. 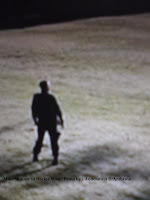 Mike Skinners Role : Security Guard. 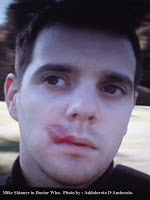 Mike Skinner's Line : "It's a beautiful day"
With Simon Dutton as Alistair who wipes the hallucinogenic lipstick from Mike Skinner's face. It was indeed "a beautiful day" after seeing Mike Skinner's beautiful face. The camera crew took full advantage of Mike's photogenic face and large innocent eyes with their close range filming. I hope this is the beginning of more to come from Mike Skinner in the acting world. His 30 seconds was convincing and full of engagement. Well done Mike, you have made us proud again.